What is the most challenging aspect of learning Spanish? Can you guess? Finding helpful and engaging reading material you can actually understand.... That is exactly what inspired us to create this audiobook. How is a student supposed to learn when language instructors love providing materials that are tough expert-level literature with tons of grammar and rules? That style of content for new language learners can be overwhelming and lead you to flip back and forth between a dictionary and your book...constantly! That's not an effective use of your time, nor is it the best way to learn. Is this how children learn their language skills? No. 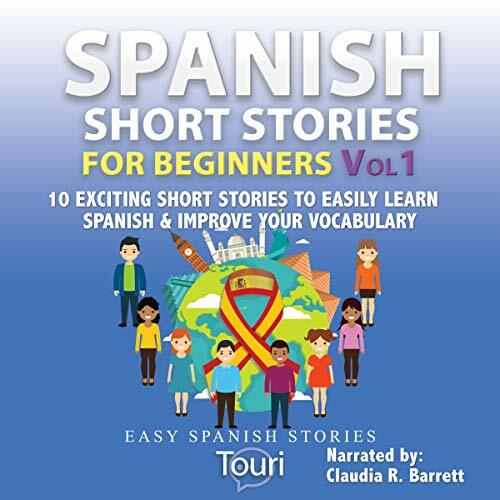 Enter Spanish Stories for Beginners: You will find 10 easy-to-listen-to, engaging, and fun stories that will help you to expand your vocabulary and give you the tools to improve your grasp of the Spanish language. Improve your comprehension, grow your vocabulary, and spark your imagination with these 10 unconventional Spanish short stories! All stories are written using vocabulary you could easily use in your day-to-day conversations. The stories are written with beginner Spanish learners in mind. With that said, it is highly recommended to have a basic understanding of Spanish to achieve maximum enjoyment and effectiveness of the lessons. A summary in Spanish and in English of what you just heard, both to review the lesson and for you to gauge your comprehension of what the tale was about. I'm confident I'll be fluent with it in no time. So appreciate this! It's very convenient. I get to listen to it anytime and anywhere. The Spanish short stories are light and each of the message are narrated concisely that I didn't have a hard time learning it. Thumbs up! It's one classic Spanish guide I wouldn't miss if I were you. I started studying the book,listening to one chapter a day and how rewarding it is as I begin to make some progress. The stories are short but captivating. I didn't experience any boredom at all!